Monster Hunter is now synonymous with the PSP. Back in late 2004 and early 2005, that wasn't the case. Monster Hunter was a PS2 game, and Sony was still convinced that the PSP was its new Walkman. 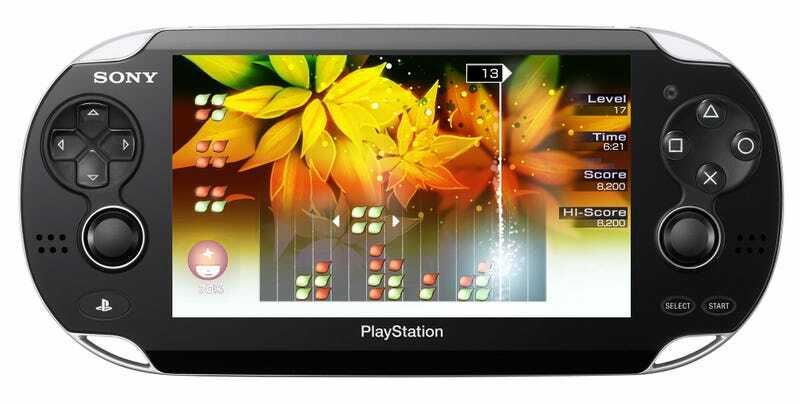 Puzzle game Lumines, which launched in Japan in December 2004, was the PSP's killer app. It took advantage of the PSP's screen and multimedia capabilities. It's now 2011. There have been sequels, good sequels, but Lumines hasn't felt as fresh as it did back in those cold winter months of late 2004 and early 2005. With Lumines: Electronic Symphony, Q Entertainment is bringing Lumines back to its electronic roots. According to Q Entertainment's James Mielke, the goal was to create a survey of electronic music—an electronic symphony, if you will. The gameplay will be familiar to anyone who has played Lumines. On the PS Vita's screen, it pops and comes to life. The individual blocks that players must stack and clear are rendered in 3D—something that can be seen when moving the blocks quickly right to left and the perspective shifts ever so slightly. It's a small thing, but it makes the blocks feel far more tangible, weighty even, than in previous Lumines games. While playing the title's short demo, I could feel myself going back into that zone that should be so familiar to Lumines players—the one where your eyes go out of focus a wee bit, and you become entranced by the music, the images, and the falling Lumines blocks. One significant change this time around is that the player's Avatar is now connected to an Avatar Meter. When it reaches one hundred percent, players can use it to unleash a special ability. The ability in the demo was a "chain block" that would clear one of two block colors. It's randomized so you don't know which color the chain block will clear until it falls. Q Entertainment is planning to offer nine different Avatar Meter abilities, which can be unlocked during gameplay, along with new filters and new skins. When players start the game, they must select an Avatar ability and keep said ability until they clear all the stages. The game should have "dozens" of stages and unlockable content. There are also new game modes like a two player versus mode called "Duel Mode" and a race-against-the-clock-mode called "Stopwatch Mode". I only saw one skin. From what I saw, Lumines: Electronic Symphony looked like Lumines on the PS Vita—and that looked pretty damn great.